moving an organisation towards e-learning delivery of courses: organisational change strategies. 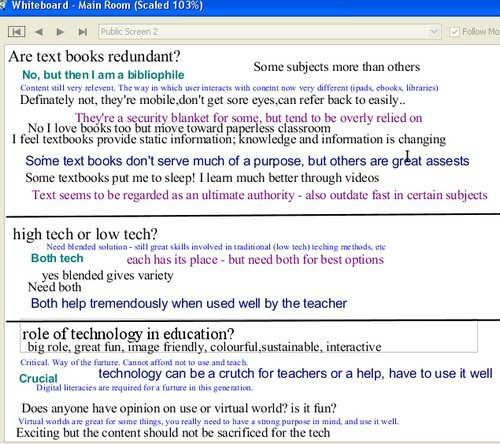 This is a topic that recurs periodically – and each time we talk about it there are different ideas and insights shared helping us all to consider what we might do to move our own organisations in the direction of e-learning whether this is part of our formal role or because it is our passion. We started with a blank whiteboard headed with the topic title for ideas about strategies. This wasn’t blank for long as we all had many ideas about encouraging change. The whiteboard remained central to the session with ideas added throughout the session. a brief mention of models for change and technology acceptance. To get the full picture check out the recording, then add your own ideas and suggestions as comments on this post. This was a terrific session! The time flew by, and as always when we discuss organisational change there were many ideas flowing. This was a session that could probably have gone on much longer with more in depth exploration of strategies and their practical implementation and also closer look at the models for change and technology acceptance. Our next Webinar is a FineFocus session. Join Phil Hart (@philhart) for “E-portfolios – a personal journey” in which Phil will share his experience of developing e-portfolios to provide complete evidence for Recognition of Prior Learning in higher level vocational qualifications. Join us on Thursday Jan 10th at 23:00 GMT/UTC the time for you will vary depending on your timezone (check yours here) Thursday afternoon/evening in the USA, late night Thursday in Europe, and Friday morning Jan 11th in Australia – in the usual Blackboard Collaborate virtual room. This session was exciting! For me it also felt very strange as I had to leave half-way through so Phil (@philhart) was the main facilitator from the start, and I caught up with the second half of the session from the recording which is well worth a watch and listen. The reason for needing to leave early was an interview at work for a advanced standing as a lecturer – what is known in Western Australia as “Advanced Skills Lecturer”. For those of you who were in the session when I mentioned this – I was successful! 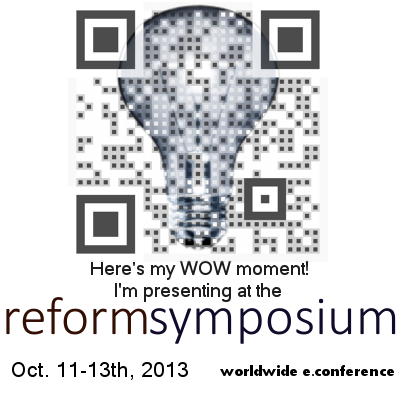 We had several people who are due to present at “The Reform Symposium (#RSCON3)” who were keen to learn more about using Elluminate from the presenter’s perspective so this was the chosen topic at polling time. We started with a whiteboard for people to add anything specific they wanted to know about and this informed the entire session. We made everyone moderators so that they could easily access the extra tools they will see as presenters. The session was terrific with masses of interaction, discussion and sharing – truly Serendipitous with everyone sharing their own Elluminate knowledge and with instant learning going on through experimentation. Takeaways were very positive. In answer to a couple of the questions raised that were not fully clarified due to lack of time. 1. It is possible to use a YouTube video – there are at least three possible ways: a) WebTour which will just take everyone to the link via their own browser (usually but not always starts immediately); b) do it by putting the link into the multimedia library (in my experience this doesn’t always work); c) put the link on whiteboard or in chat for people to access (it is good practice to make the link available in chat/whiteboard anyway. 2. Using Prezi – not ideal it can be application shared but app share is not generally very good with anything that frequently updates or is “swoopy” and also not good for anyone with a slow connection. This was a fantastic session and Phil did a great job especially as he was “thrown in the deep end” with respect to the chosen topic. He is a very experienced and brilliant Elluminate facilitator but a little less familiar with all the tools and capabilities than myself. If you are about to, or might in the future be presenting/facilitating and Elluminate session then this is definitely one to catch! 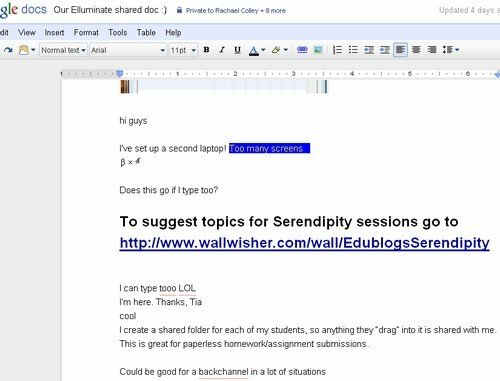 Serendipity webinar overview – Are those huge expensive conferences outdated? This recorded session buzzed from start to finish. We had a very lively group of participants with an initial dead heat for topic with the final choice being to discuss the continuing relevance or otherwise of the very large (often sponsored by businesses but nevertheless very expensive for participants) conferences . I feel that the topic was in part inspired by the upcoming Reform Symposium 48 hour onlince conference at the end of this week, and the juxtaposition of this with some of the very large expensive face-to-face conferences that have happened recently. The discussion flowed along using our usual blend of audio, textchat and whiteboard and began with some consideration of what we might consider to be large paid conferences and also some clarification of what we understood by “unconference”. We spent some time considering the pros and cons of the large, sponsored, but often still very costly for participants, conferences. Discussion then moved on to explore why these were so expensive for participants particularly when they are often ponsored by businesses and how they might be made less expensive. As is usually the case when we have a session the buzzes along with lots of audio input you will get much more from the recording than frem reading this overview. Our next Webinar is an Edublogs “Fine Focus” session a “Tools and Strategies” “YouTube in the Classroom” when Bill Genereux, associate professor of Digital Media and Computer Technology in the Engineering Technology Department of Kansas State University, joins us . YouTube is powerful because it is popular, but it is widely prohibited on school networks. Bill will discuss his recent efforts to learn how students and educators are portrayed on the social media video website YouTube using digital ethnographic research methods pioneered by Michael Wesch. A very lively recorded Serendipity session this week in the Edublogs/Elluminate Community Partnership room. 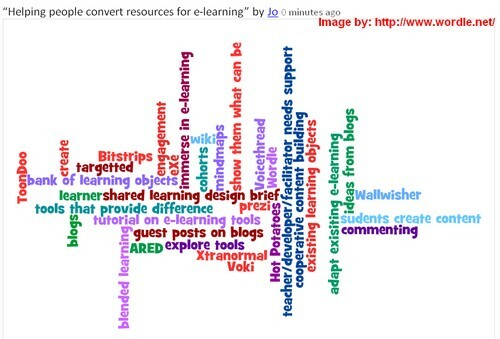 The topic chosen was “helping people to convert materials for e-learning”. As usual in these sessions the discussion was wide ranging not just narrowly focused on the precise wording but including many stories from participants of e-strategies that they use and that provide terrific examples to help those needing to convert materials for e-learning. The microphone, text chat and whiteboard were all humming with activity giving us many ideas to consider. Comments throughout and at the end suggested that much serendipitous learning had indeed occurred this week, and that we had lived up to our name. I think that the sessions always provide learning, food for thought and are engaging but it’s very exciting when we get a “Wow!” session such as this one. In my opinion these happen mostly when the topic chosen is broad, and links very strongly with the passions of participants. Our next Webinar is an Edublogs “Tools and Strategies” where guest presenter Tomaz Lasic (teacher, coach & mentor) will present “Teaching with Moodle”. Currently at Moodle HQ where he is an interface between educators and Moodle developers. Tomaz has many Moodle stories to tell – today he will give us an overview and then throw the session open to questions (not-tech) about using Moodle “on the ground” Join us on Thursday March 25th at 23:00 GMT (7pm USA EST, Midnight CET) or Friday March 26th at 7am West Aus, 10am NSW, depending on your timezone – in the usual Elluminate room.